Susan D. Franzosa is a contributing author, "John Holt"p. 380-383. Book description: The throngs at Woodstock, Jane Fonda in Hanoi, "I Have a Dream," burning draft cards, fire in the streets--these images of the 1960s are still very much alive today. What happened to the people and principles that dominated that decade? Which leaders from those turbulent years had the most lasting effect on our lives today? How well have the principles for which those leaders fought so strongly withstood the test of time? This thought-provoking biographical dictionary allows the reader to study the leaders, both conservative and liberal, their ideals, and their enduring influence. With major sections on racial democracy, peace and freedom, sexuality and gender, the environment, radical culture, and visions of alternative societies, Leaders from the 1960s includes entries on a wide selection of nationally prominent activists of the 1960s. In addition to those who dominated only the sixties, the volume includes earlier activists who came into prominence in the 1960s and activists of the era who came into prominence since the 1960s. Each entry provides a biographical sketch, but the focus of the entries is on the person's basic concepts or the essence of his or her work and the public response it generated. Included are extensive bibliographies on the individuals and the period. Franzosa, Susan Douglas. “John Holt” in Leaders from the 1960s: A Biographical Sourcebook of American Activism, Ed. David DeLeon, Wesport, CT: Greenwood Press, 1994, 380-383. 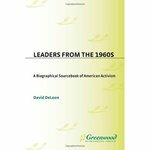 DeLeon, David and Franzosa, Susan D., "Leaders from the 1960s: A Biographical Sourcebook of American Activism" (1994). GSEAP Faculty Book and Media Gallery. 8.